UPDATE (5 December 2017): The article below is from 2012 - how many mobile phone users have ignored this warning and continue to use or carry a cell phone against the body? This warning concerns not just Apple iPhones but nearly ALL cell phones. How many cell phone users are still ignoring this warning? The U.S. government is aware of the potential dangers from cell phone radiation! Cell phones are NOT the safe consumer devices the industry wants us to believe. All new models of cell phones – before they can legally be sold – are required to undergo testing to ensure the radiation levels don’t exceed a specified amount. However, the federal agency that oversees this testing (the FCC) allows manufacturers to “cheat” on this test by holding cell phones up to 1 inch away from the testing device so the radiation levels appear much lower. This enables manufacturers to pass the test which would be unlikely if cell phones were tested in the manner in which they are used – directly against the body in pockets and tucked into waistbands and even bras (read “Carrying cell phone in bra may cause breast cancer”). 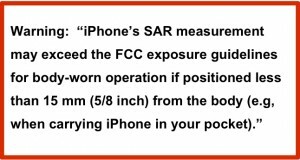 Because of this testing “oversight”, the FCC requires that every user be warned to never carry or use a cell phone closer than this “separation distance” or risk being exposed to radiation levels that exceed the FCC safety limit. This is why the warning is in all iPhone user manuals. Apple doesn’t want you to know about this or you may discover the truth – that cell phones aren’t the safe consumer devices you have been led to believe they are. In May, 2011, the International Agency for Research on Cancer convened over two dozen of the world’s top scientists who reviewed all the peer-reviewed studies published to date, including the 10-year, industry-funded, international Interphone study. Alarmed by the results, all but one of the scientists voted to classify the radiation that is emitted from cell phones as possibly cancer causing. In particular, the research showed an increased risk of malignant brain or auditory nerve tumors in those who had used a cell phone for 30 minutes a day for 10 years. This prompted the World Health Organization, on May 31, 2011 to classify the radiation emitted from cell phones as a possible carcinogen. CTIA Wireless Association, the powerful lobbying and propaganda machine of the cell phone industry immediately contacted all major corporate media outlets with their “spin” that the World Health Organization was no longer to be trusted as a source of health information. Their scientists wrote numerous articles casting doubt on the research; and the over 300 million cell phone users in the U.S. either never got the warning or were lulled back into complacency about the possible health risks from their cell phones. The new CEO of Apple, Tim Cook, has been contacted and informed about the deceptively hidden radiation warning in iPhone user manuals. I urged him to simply have the warning made visible and located in a more prominent location in the user manual so it can be seen. This is about consumers having “informed consent” – so they know the potential health risks and can make their own decisions about safe ways to use their cell phones. Mr. Cook chose to ignore my email. This Lab Rat does not give up easily; I will politely pursue Mr. Cook and attempt to convince him to have Apple do the right thing by their customers. Telling the truth and refusing to go along with the CTIA and the rest of the wireless industry’s consumer deception could go a long way to repairing some of their recent PR missteps. Click on the Facebook icon at the top of this article and then send this article’s url link around to your email contacts. We can’t rely upon the industry or the media to get this message across. I will keep you posted on Apple’s response to my continued “encouragement” to do the right thing.